Kittens are excellent therapy animals. Puppies just make you smile. Petting animals can be a stress reliever. Pet therapy is a popular method of mild therapy for seniors with documented physical, mental, and emotional benefits. Animal therapy variations can differ depending upon the needs of the seniors like visitation, ownership or animal-assisted therapy. There are several types of animal-oriented therapy, and each one delivers different benefits for different conditions. Visitation therapy: This is the most familiar type of animal therapy and involves animals, typically cats or dogs, coming to hospitals, nursing homes, or senior centers to visit with residents and patients. Residents therefore get the loving attention of the animal without the necessary care requirements, which is beneficial in facilities where pets are not permitted. Ownership therapy: Pets can be valuable as a prescription, and alternative therapy practices often encourage owning pets for the mental and emotional benefits. Individuals interested in ownership therapy, however, should carefully consider the needs and requirements of the animal when choosing a new companion. Animal-assisted therapy: This is a more intensive type of therapy where patients in need of extreme rehabilitation are paired with incredibly sensitive animals, often dolphins or horses, as part of an intensive therapy regimen. Interacting with the animals can build confidence as well as refine physical skills. Individuals interested in undergoing pet therapy should first consult a therapist familiar with the different approaches to determine which one would be most suitable and beneficial. The benefits of an animal-human bond have been documented for centuries. The relationship between a therapy animal and a patient, however, extends far deeper than simple companionship; there are physical, emotional, and mental benefits to this type of treatment. How can you find animal therapy programs in your area? 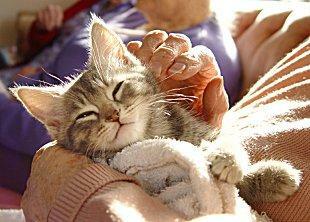 Nursing homes - Nursing homes often coordinate with volunteers regarding the use of pets as therapy for their residents. Centers can often provide contact information for organizations and individuals who use pets in therapy sessions. Call your local nursing homes to find out more information. Department of human resources - Local branches of a community's department of human resources sometimes have a separate department that coordinates senior citizen services. These departments often have a list of volunteers and community resource information that pertains specifically to seniors' health and welfare needs. Health departments - Your local health department may have a list of pet therapy programs in the area. Physicians - Many doctors, especially those who specialize in geriatric care, are knowledgeable about a variety of resources for senior citizens, including alternative forms of therapy. Pet stores - Call or visit your local pet store for information on pet therapy in the area. Before buying a dog or cat for a special senior in your life, try out a few things first. Firstly, if you don't know how the person feels about animals, ask him. It's also important to remember that what a person wants and needs may be two separate things; in addition to asking about how the person feels about a pet, take a moment to seriously consider whether or not a pet could be taken care of. If having a pet at home is not possible, try a senior center where animals come to visit several days a week, or classes in dog grooming are a fun activity. While not all seniors can, or are able to, take care of an animal themselves, pet therapy may be just what is needed to put a smile on the face of that special senior in your life.